Lizzie is the busiest, buzziest bee in Hivetown! 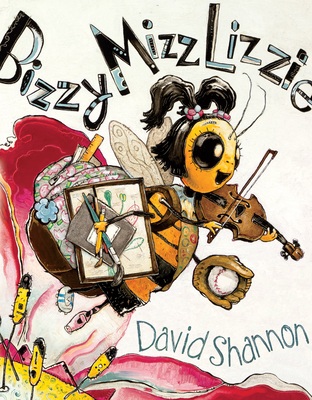 David Shannon's vivid artwork and Lizzie's endearing efforts to "do it all" will make children laugh aloud at her frantic antics as she juggles school, multiple sports, dance, violin, and art. With charm and determination, she longs to impress the Queen by winning a spelling contest, but she studies to the point of exhaustion. When she dozes off in the middle of the competition, the only solution is rest -- and her refreshing visit to the local Garden finally teaches Lizzie to stop and smell the flowers, "which . . . is exactly what bees are supposed to do." Shannon's exuberant new book is funny and fresh, approaching the subject of over scheduled children (and adults) with breezy good humor and delivered with his signature fun and heart. David Shannon is the internationally acclaimed creator of more than thirty picture books, including No, David!, a Caldecott Honor Book and his second New York Times Best Illustrated Book of the Year, and three more David picture books. Shannon's bestsellers include A Bad Case of Stripes, Duck on a Bike, and Too Many Toys! He lives in California with his family.